I love home made soup nothing beats it, however sometimes it’s good to have an even quick option up your sleeve. Most of the soups you see in Supermarkets are loaded with dairy (cream normally), wheat and often high in salt and sugar. I spend time searching label ingredients in the hope I might find a convenient soup that I can eat. Water, tomatoes (19%), onions, green lentils (6%), tomato paste, carrots, red peppers, courgettes, celery, sugar, vegetable oil, garlic, salt, thyme, rosemary, parsley, white pepper. Vegetables (20%). The soup is tastes great, tomato(y) as you would expect but the lentils give it a lovely texture and depth of flavor – big tick to New Covent Garden Soup. 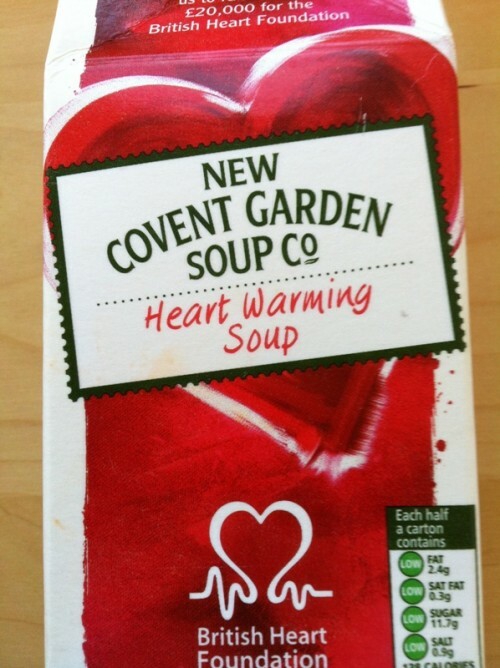 As well as tasting great The Heart Warming soup is also promoting the British Heart Foundation. Hello Lisa really glad it helped, it always annoys me that so many pre packed soups have dairy in, but I always keep my eye out for ones that don’t as you never know. The tomato based ones tend to be the ones that are more suitable. Let us know if you find any that are suitable for you too. I make a ‘cream’ of tomato soup using coconut milk. It doesn’t taste coconutty and is delicious.